January 21 is a national holiday in the United States that honors Martin Luther King, Jr. As I’ve written elsewhere, King first came to prominence as a civil resistance leader during the Montgomery Bus Boycott in 1955-56—one of the earliest sustained nonviolent direct action campaigns of the US Civil Rights Movement. Yet, the Montgomery Bus Boycott was not inspired by King. It was inspired by Rosa Parks, a middle-aged seamstress who refused to move to the back of a segregated city bus on December 1, 1955. For a long time, I thought that Parks acted spontaneously because she was tired, but in fact she was an experienced activist and had received semi-formal activist education and training from a "movement halfway house", a type of movement institution that I’d like to explore in this post because of its central role in reinforcing—and even prompting—history-altering nonviolent movements. I first heard of movement halfway houses in US sociologist Aldon Morris' book The Origins of the Civil Rights Movement: Black Communities Organizing for Change (1984). Morris coined the term to refer to organized efforts to offer activists political education and skills training. According to Morris, movement halfway houses are common in successful movements, but are difficult to see because they are often behind the scenes, and are very diverse in their structure, size, and level of formality. Morris argues, however, that you can learn to recognize movement halfway houses in history if you look for any organized efforts with this goal—to increase the effectiveness of social movements by educating and training "the leadership and the rank-and-file to bring about social change." To make his case, Morris notes that nonviolent civil resistance "was practically unheard-of in Southern black communities before the civil rights movement." Yet, in the black freedom movement that emerged in the US South in the 1950s and 1960s, "large masses of black people ultimately became directly involved in economic boycotts, street marches, mass meetings, going to jail by the thousands, and a whole range of disruptive tactics commonly referred to as nonviolent direct action." How did this happen? Morris answers, "movement halfway houses." Click to expand. Highlander Folk School Main Building, year undisclosed. Source: Wisconsin Historical Society. He cites many examples, like the Fellowship of Reconciliation and the 1960 training workshops led by James Lawson in Nashville, Tennessee. 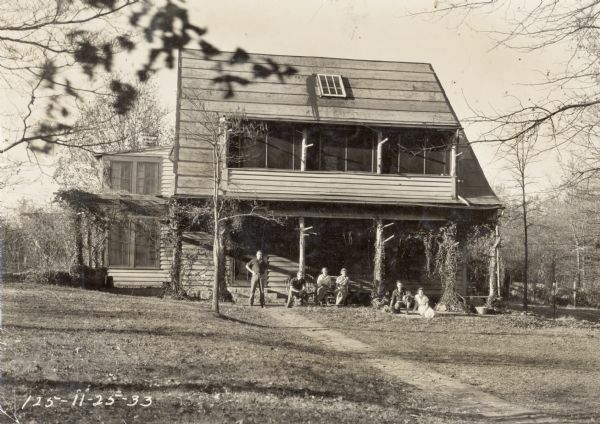 Yet, the main example he cites is the Highlander Folk School, which was opened by Myles Horton in the early 1930s. Horton was a working-class white southerner and the first in his family to go to college. He became convinced that "adult education could be used as a potent agent of social change." 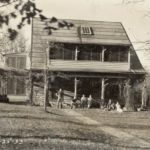 Horton then decided to organize the Highlander Folk School as an innovative movement halfway house in the Southern Appalachian Mountains in Tennessee. His aim was to bring poor and oppressed people together, encourage them to grapple with their everyday social problems, provide an arena for deeper political reflection, and, ultimately, provide training workshops in the skills and strategies of nonviolent social movement organizing. The School's mission was to "assist the oppressed in overcoming their problems by training potential leaders." During the 1930s and the early 1940s, Highlander focused most on the fledgling southern labor movement. Yet, the school's interest quickly turned to assisting the development of a racial justice movement to fight against the southern US system of white supremacy. To deepen Highlander’s work, Horton hired Septima Clark as Highlander's Education Director. She was an African-American public school teacher who had been fired and blacklisted because of her community activism. Clark soon cemented Highlander's ties with many people who became key organizers in civil rights groups such as the Southern Christian Leadership Conference, the Student Nonviolent Coordinating Committee, and various local campaign organizations. At Highlander, these people were encouraged to take what they learned and apply it back in their own communities. Horton and Clark routinely exhorted the participants in Highlander's training workshops to act on the knowledge they gained at the school once they return to their communities. 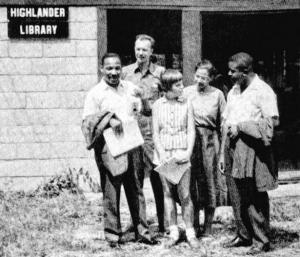 Martin Luther King Jr., Pete Seeger, Rosa Parks, Charis Horton (Myles Horton’s daughter), and Ralph Abernathy at the Highlander Folk School in 1957. Source: Highlander Research and Education Center. Rosa Parks is one of the best-known of Highlander's graduates. Before Parks' famous act of civil disobedience that started the Montgomery Bus Boycott, she attended a ten-day training session at Highlander that is well described in her biography. Through this experience, Parks learned about civil resistance campaigns and how activists had used the boycott tactic around the world. Some civil rights activists had even achieved small gains against segregation using bus boycotts. During a radio interview decades later, Studs Terkel asked Parks what role Highlander had played in her momentous decision to resist the system of racial segregation. She answered, "Everything." Movements need people like Rose Parks and Martin Luther King. Yet, they also need activist educators like Myles Horton and Septima Clark. Learning about the people who organize and run movement halfway houses can inspire our own work, as well as teach us much of what we need to know about how to create, expand, or improve movement halfway houses today. I can now tell dozens of stories about movement halfway houses from around the world. They have inspired and informed my own work—and these stories have also often inspired and helped others. Nadine Bloch, Education and Training in Nonviolent Resistance, United States Institute for Peace, Special Report #394, October 2016. Featured image: The Highlander Folk School historical marker, Tennessee, USA. Source: Wikimedia Commons. Steve Chase is a long-time activist, educator, and writer. 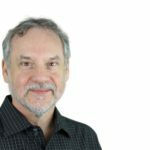 He was an editor at South End Press for many years, the founding director of Antioch University’s master’s level activist training program in Advocacy for Social Justice and Sustainability, and is currently ICNC’s Manager of Academic Initiatives.